Selina Manuel Antonio kohteessa Manuel Antonio, Costa Rica: Varaa nyt! Selina Manuel Antonio is the place for you to feel in tune with nature. Here, you can find the most amazing joint experience of jungle and beach at the same time. 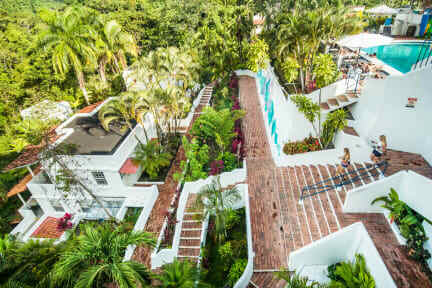 Beginning in our inside property trail to the spectacular rooftop deck with a 360º view of the jungle all the way to the beach. Whether you’re looking to indulge or need to stretch your travel budget across the continent, we’ve got the perfect room for you. With great Wi-Fi connection, unique food from our restaurant and the best party vibes in Manuel Antonio, Selina is an experience you cannot miss. Different activities and tours to perform in the surrounding area. Also, shuttles service to the other Selinas, as to another parts of the country. Cancellation policy: 3 days before before arrival. Taxes not included - 13%. Breakfast not included - $3.00 Minimun - $10.00 Maximun USD per person per day (sold by weight). Children are allowed only on private rooms.